Expect some morning fog, then partly sunny skies and warm with an isolated shower. 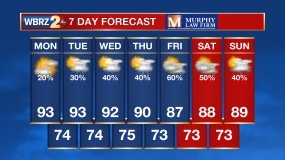 Highs will be in the low 90s. Lows will be in the mid to low 70s under mostly clear skies with another chance of fog. Not a lot changes this week except the seasons. Autumn begins at 3:02 Friday afternoon. Other than that, expect partly sunny skies and a real muggy feel through the weekend. Temperatures will remain in the high 80s and low 90s throughout the afternoons. At night, temperatures will only drop to the mid to low 70s as a result of the humid air. When there is a lot of moisture in the air, the temperature has a hard time falling. In the tropics, José will brush by New England, but Maria continues to barrel through the Caribbean. It is forecast to eventually make a turn toward the north as it approaches The Bahamas and is not a threat to the Gulf Coast at the moment. Another system in the central Atlantic has a moderate chance for development into a named storm by Friday, but the good news is that this storm is forecast to also turn north almost immediately.